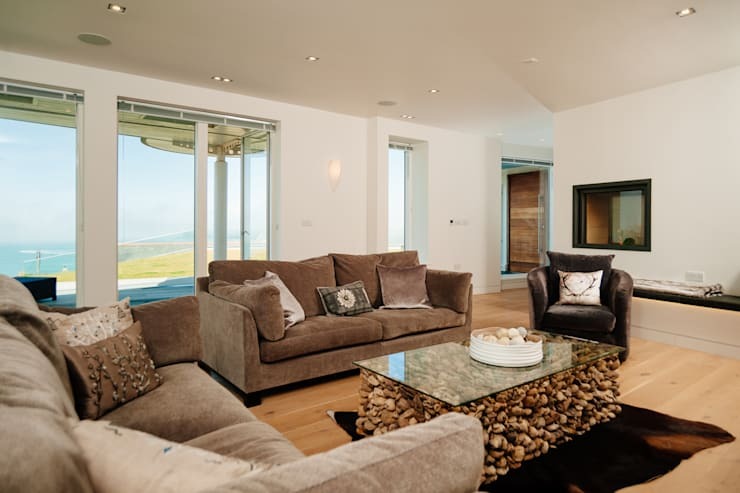 This stunning home, brought to us by The Bazeley Partnership, proudly perches atop a hill on the coast of the UK's Cornwall, and combines beautiful, modern architecture with a brilliant seaside view. From the outside the abode almost appears as a kind of contemporary castle, with its high vantage and unique facade presenting a bold and intriguing design. 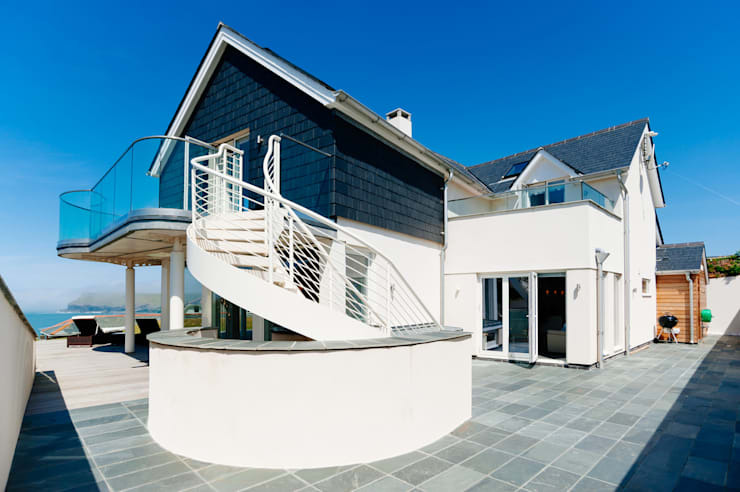 The rendered, white walls of the lower level support an angular upper floor finished with dark, grey roof tiles, while a sleek, spiral staircase flows between the home's levels to stylish effect. Once inside we're greeted by pale decor housing a range of understated furnishings. 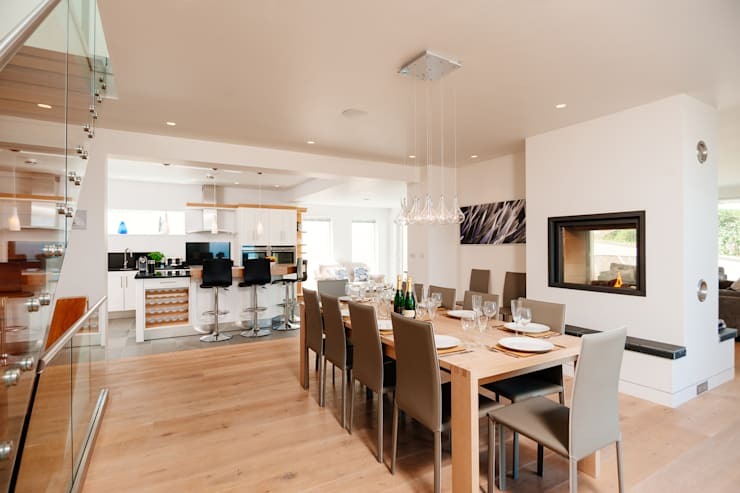 The lower level of the home comprises living, kitchen and dining spaces, which blend together in an open plan, variously displaying casual, formal and modern design elements. The upper level conjures a slightly more luxurious atmosphere. A voluminous lounge suite in the upper living space sits primed for exclusive relaxation in the midst of the home's gorgeous view, which streams in through an expansive array of windows. 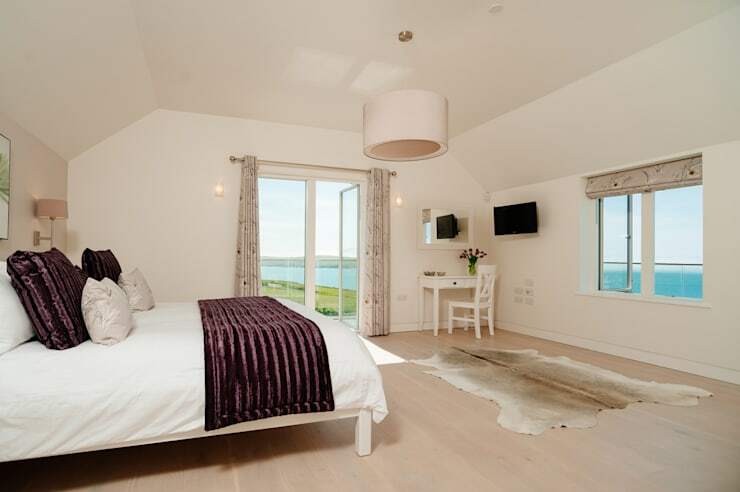 The bathroom is decorated in simple style, with a capsule bath resting pride of place within the room, privy to a stunning view of the seaside beyond, and the home's bedrooms present a serene and inviting air, with pale tones and simple furnishings creating a lovely space in which to retire to rest. Perched on a hill overlooking a stunning view of the Cornish coast, the home truly rests in an idyllic setting, surrounded by crystal blues and grassy greens. The home's facade presents a stylish blend of white and dark grey, with its rendered lower walls supporting a tiled upper level. 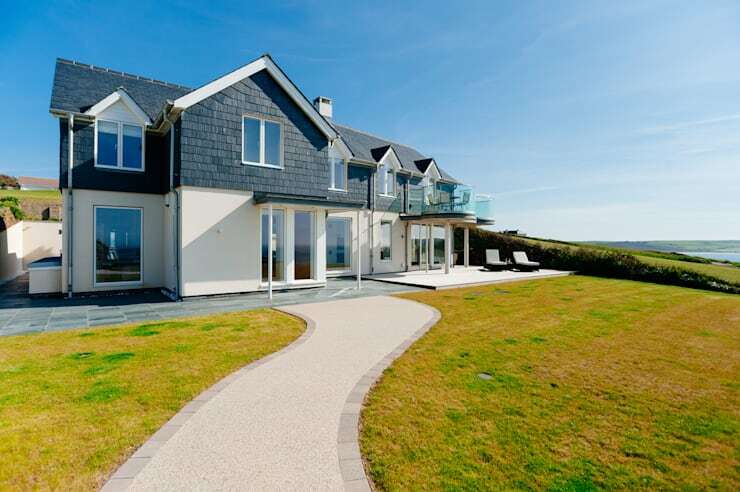 Glass balustrades and an extensive array of windows allow light to flow within, making the most of fine coastal weather, while expansive decking borders the abode, providing many vantages from which the occupants can enjoy a beautiful view of the Cornish coast. An alternate view of the home's exterior displays the dwelling as a brilliantly constructed, contemporary castle. Its wonderfully simple blend of white and grey creates a bold colour contrast, while the mix of curves and angles characterising the home's construction presents a subtle but novel design feature. The grey tiles lining the courtyard sooth the space with their sense of flow, while the use of glass in the balustrades and windows help infuse the exterior with a modern feel. Down the spiral stairwell and we're presented with a relaxed and inviting living space, decorated simply with pale decor, spiced up with the warmth of wood. The grey floor tiles of the exterior flow through to the living quarters seen here, beautifully blending indoor and outdoor living spaces, which can be sectioned when necessary by expansive, folding glass doors. The downstairs living quarters have been designed in an open plan, combining living, kitchen and dining areas. Predominantly decorated in white, the kitchen carries through the lightness of the home's interior palette, which allows for a sense of expanse and invites sunshine to permeate the space. 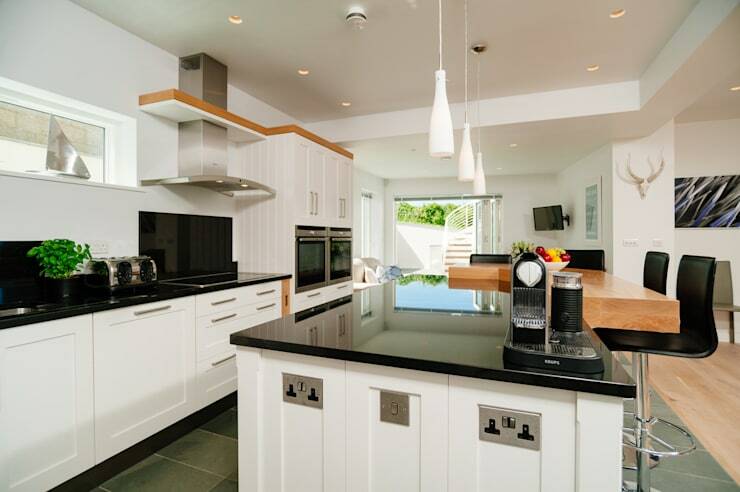 Black stone finishes the kitchen benches however, with its glossy sheen lending an air of contemporary sophistication to the space, and creating a strong colour contrast in keeping with the home's exterior. The downstairs living space also includes a stylish dining setting, with ample room to entertain guests and visitors. The streamlined, wooden table echoes the pale tone of the timber flooring that delineates this area from the kitchen and living spaces, and has been surrounded by chic, modern chairs in a matching shade. An array of blown glass lamps hang overhead, ready to provide ambience after sundown, while a contemporary fireplace can be seen behind the dining setting, poised to warm the lower level of the home during winter. Moving through to the upper level of this stunning property and we're embraced by this luxurious living space, in which darker, brown tones and flowing timber floors ground the home's lofty, white walls and ceilings. The luxurious finish of the furnishings elevate this space, providing an exclusive atmosphere in which to enjoy the picturesque view streaming through the home's windows, while another contemporary fireplace has been installed, ready to provide comfort during winter. The bathroom of the upper level of the home appears warm and inviting, with the space finished in tiles of soft, brown. Sparsely decorated, the bathroom houses a shower, sink unit and an inviting capsule bath. 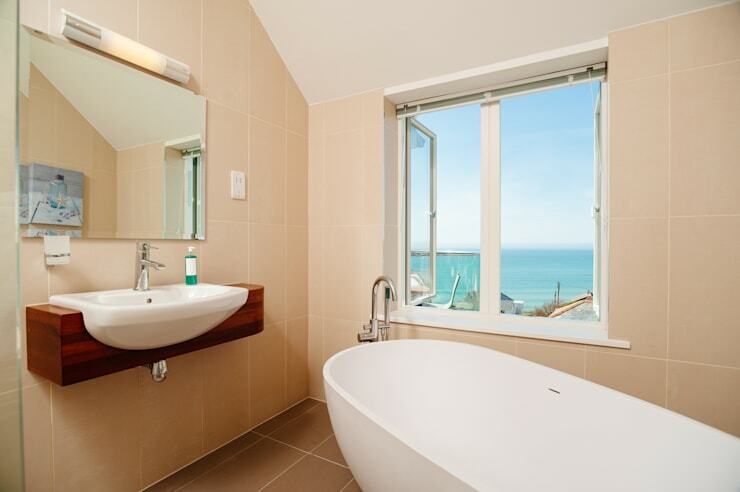 The bath rests ready to accommodate relaxation and indulgence by the room's small window, through which a stunning view of the seaside can be glimpsed. The upper level of this lovely home also houses the bedrooms, which sit in simple, inviting style. The pale tones of the timber flooring, white walls and ceilings create a light and serene atmosphere, enlivened by the colourful vista streaming through the windows. Simple furnishings populate the space, again dressed in a pale palette, adding to the room's calm atmosphere. Best of all however, is the private balcony flowing beyond a set of French doors, which provides an exclusive vantage from which to take in the sea air and sunshine. 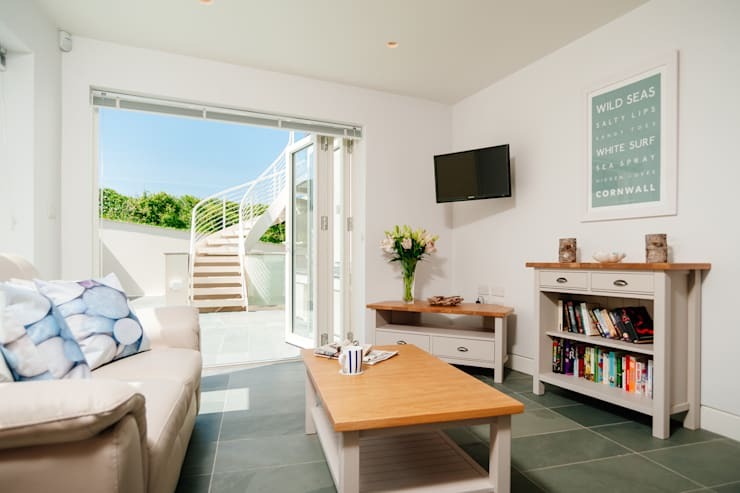 Looking to create your own amazing seaside getaway? Then take a look at The Modern Seaside Restoration for inspiration and ideas! Do you like the contemporary construction of this amazing seaside home? Tell us your thoughts below!